New York based illustrator Daniel Nyari was commissioned by Major League Soccer to direct the visuals for this year's rivalry week posters. Below is his own explanation of the project and the description of each poster. "I was commissioned to art direct this year's Match Posters for MLS Rivalry Week. 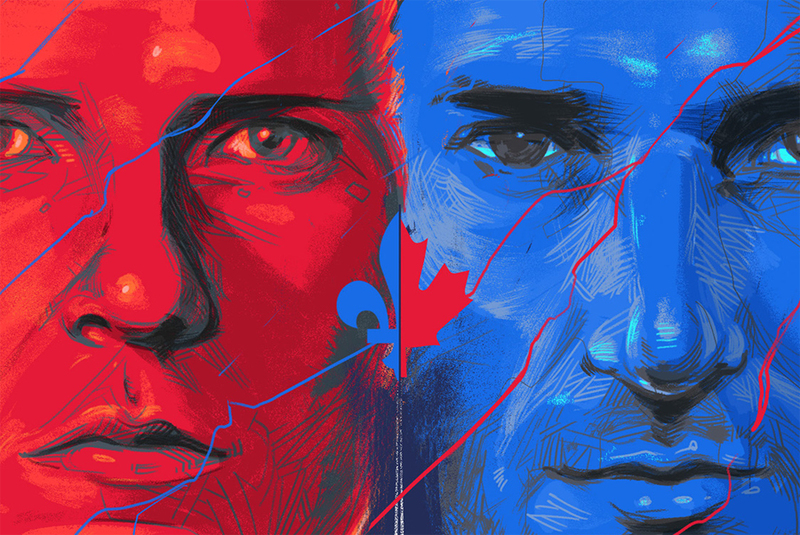 It gave me the opportunity to have a lot of fun with these and really try to re-imagine what the modern soccer poster can look like. 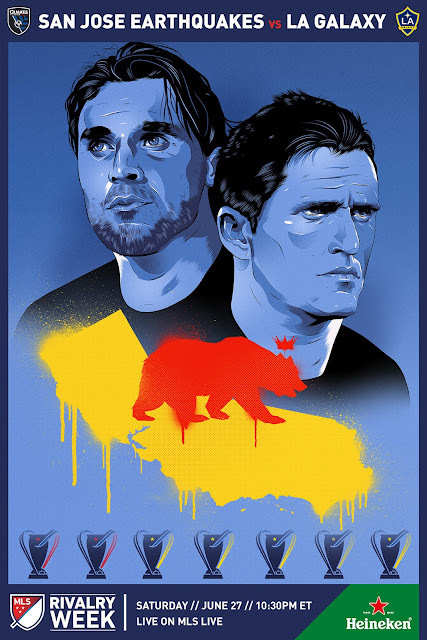 A lot of soccer posters and sports posters in general rely heavily on simply juxtaposing rivals in stylized poses with flashy graphic elements. Sometimes it's just a star player or two. 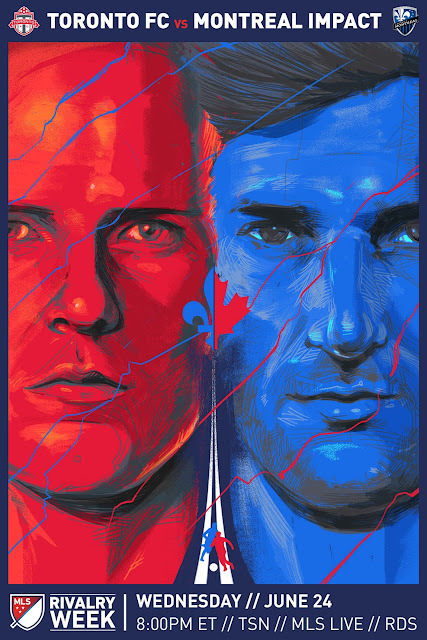 I really wanted to inject these with narrative depth going deep into the history of the competing clubs." 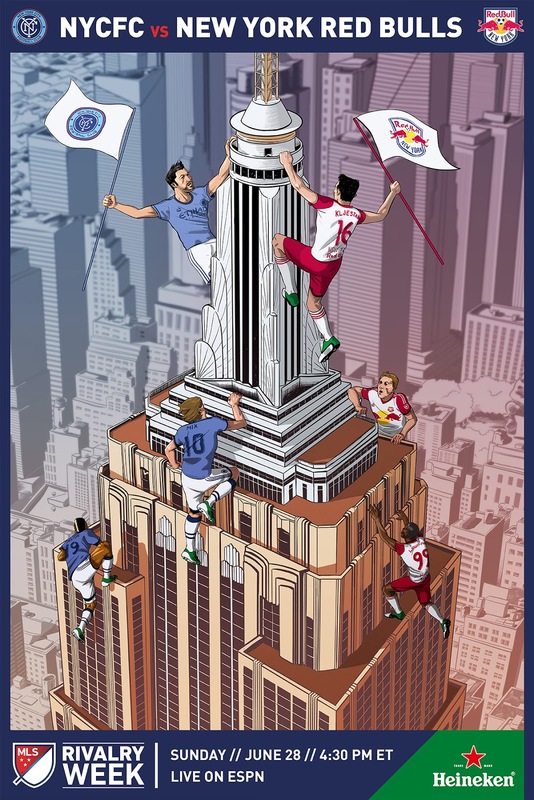 Recalling the famous scene from 1933’s King Kong, NYCFC’s and New York Red Bulls’ players race to the top to plant their teams’ respective flags and claim victory in the new city rivalry. 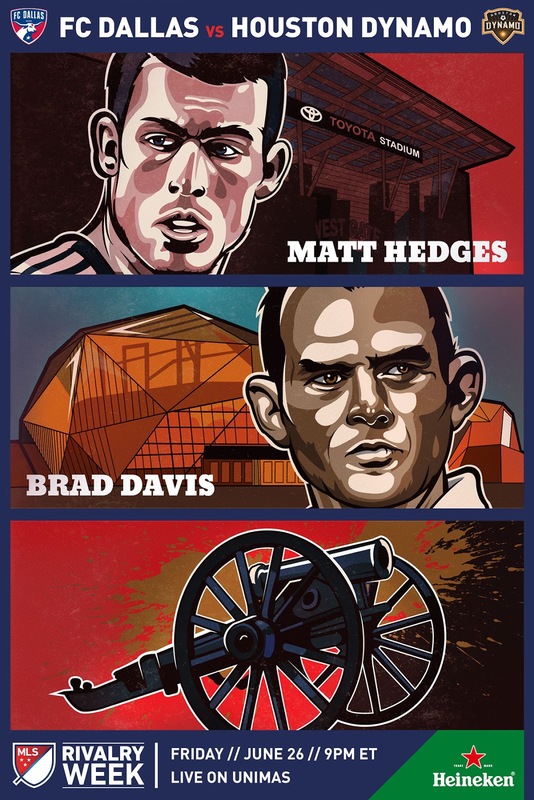 Like the Spaghetti Western was a novel kind of Western, the Texas Derby also introduces fans to a new kind of derby between the state’s two best teams battling for the El Capitán cannon. The poster frames the three major components of the derby in classic widescreen cinematic panels. Toronto and Montreal are two cities rooted in English and French traditions respectively yet are uniquely united. Two parts of a whole. The proximity of Bradley and Piatti’s faces suggest a third, central face and the middle split an allusion to the highway connecting both cities forming the roots of the derby's title "401 Derby"
We used one of California’s most well known films; Michael Mann’s film “Heat” to tell a story about two elder statesmen, league icons and MLS’s longest standing and most illustrious rivalry. The graffiti element drips down onto the history established by the two winning clubs ready to paint another chapter in their long history. We wanted to capture the larger than life culture of this rivalry, partly inspired by American folktales about giants wandering the vast forests. 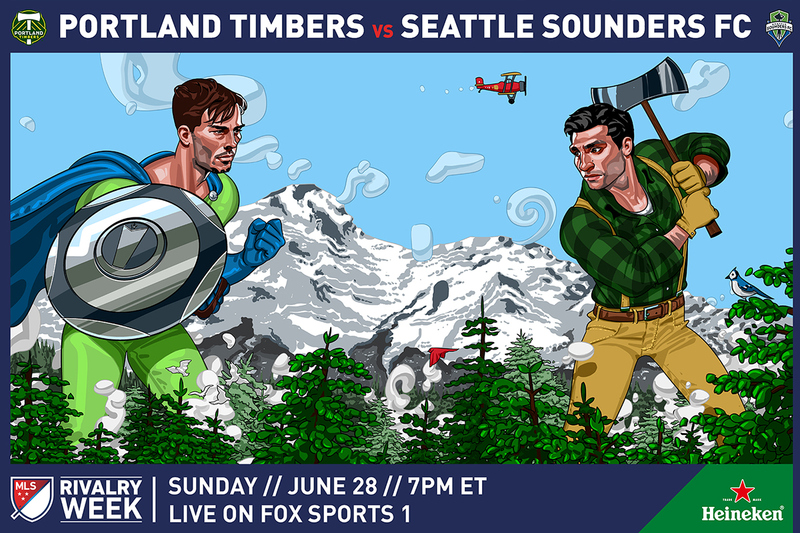 For Cascadia the the landscape plays such an important role to the two clubs’ heritage, where it becomes almost like a third character. The Seattle Sounders pride themselves on their power and noise, having just won the league's famous Supporter's Shield - Captain Brad Evans - a superhero stands proud ready to defend his trophy. The Timbers are known for their logging industry and axe logo motifs. Diego Valeri stands ready to cut down the noise. The background is laid out in landscape format to call attention to the Cascadia flag which runs horizontally in three bands of blue, white, and green.